The cart is made in the USA, it’s durable steel and aluminum construction is specialty designed for busy medical offices and hospitals. Antimicrobial protection is built into the large solid aluminum work surface and prohibits microbial growth in a light gray finish. With a 22-inch, 5 dual wheel caster base the cart can easily be moved from room to room and over elevator thresholds. The cart has a 17-inch smooth, sit-to-stand height adjustment with easy lift hand lever, adjusting from a 31-inch sitting height to a 48-inch standing height with one hand. A keyless cabinet keeps any additional USB peripherals secure when not in use. The based mounted utility basket is perfect for extra storage. Every cart comes with a 5-year, 100% full warranty. 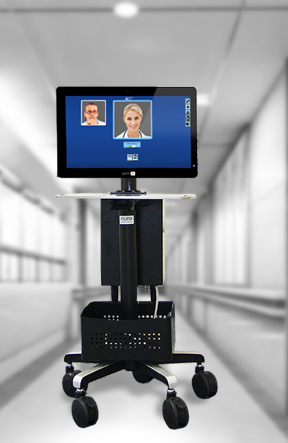 Less than an hour of your staff’s time is needed to unbox and connect Net Medical’s Video Conferencing Cart to your network. Add $2500 for multi organization, multi department use.